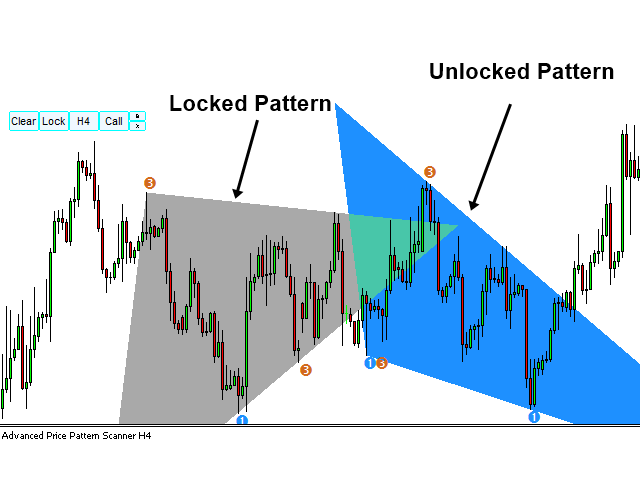 Advanced Price Pattern Scanner is the pattern scanner built upon our accumulative knowledge and insight from our financial market research many years. Advanced Price Pattern Scanner uses highly sophisticated pattern detection algorithm. However, we have designed it in the easy to use and intuitive manner. Advanced Price Pattern Scanner will show all the patterns in your chart in the most efficient format for your trading. Following pattern can be detected. 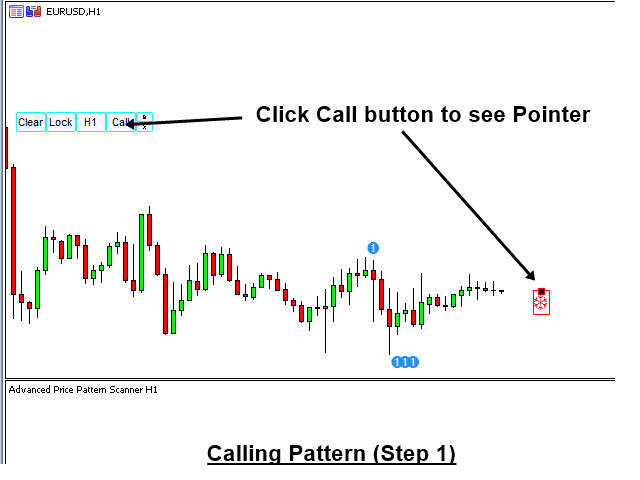 Pattern Detection in Indicator Window: Detected Patterns are located in the indicator window for your market analysis. To view or hide, just click the Circle button in the indicator window. 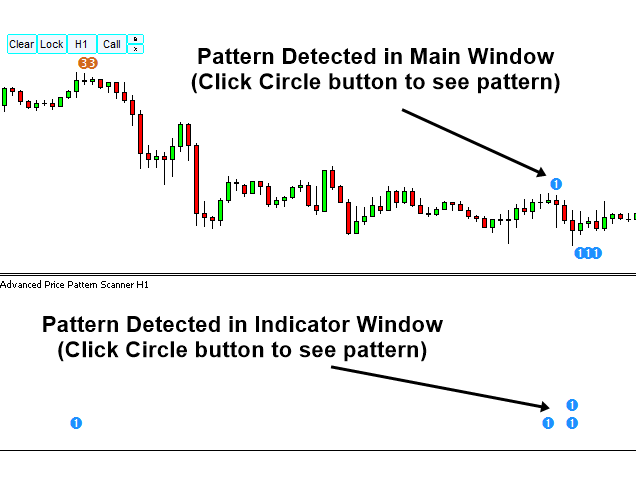 Pattern Detection in Main Window: Detected patterns are also located in the main window for your market analysis. To view or hide, just click the circle button in the main window. 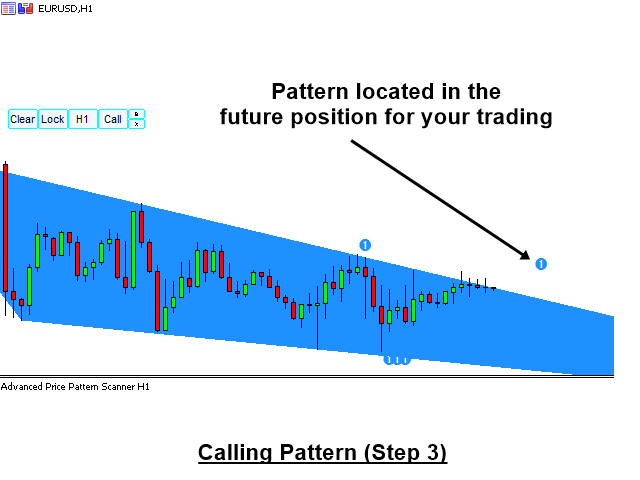 Call Patterns: You can also call any patterns at the desired location in your chart. To access Call Pattern feature, click call button. Now you will have pointer in your chart. 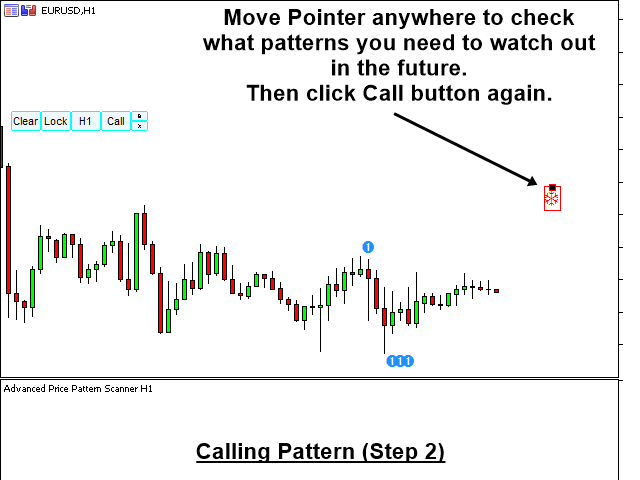 Move the pointer anywhere in your chart to located patterns, then click “Call” button again. You will see patterns corresponding to the location of pointer. 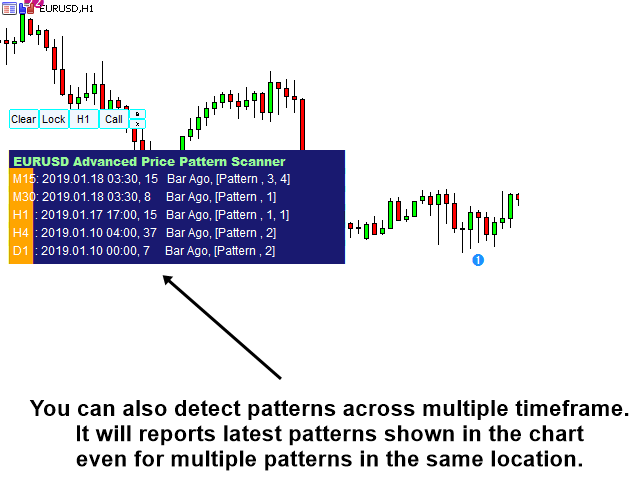 Multiple Timeframe Pattern Detection: You can also scan above patterns across different timeframe from one indicator. You can also switch on and off any specific timeframe per your need. 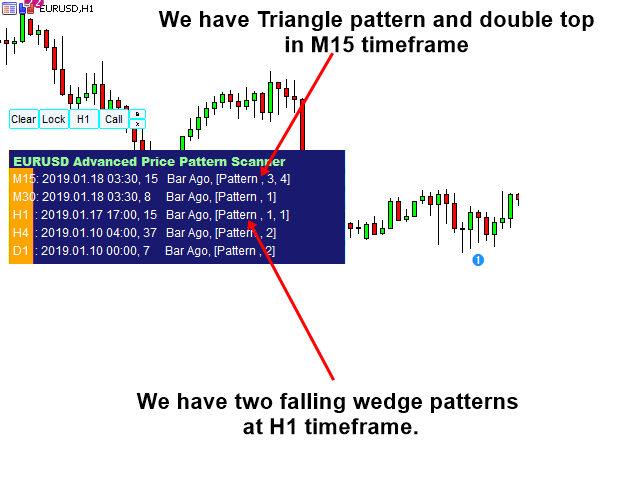 Please note that Multiple Timeframe Pattern Detection requires much heavier computation. 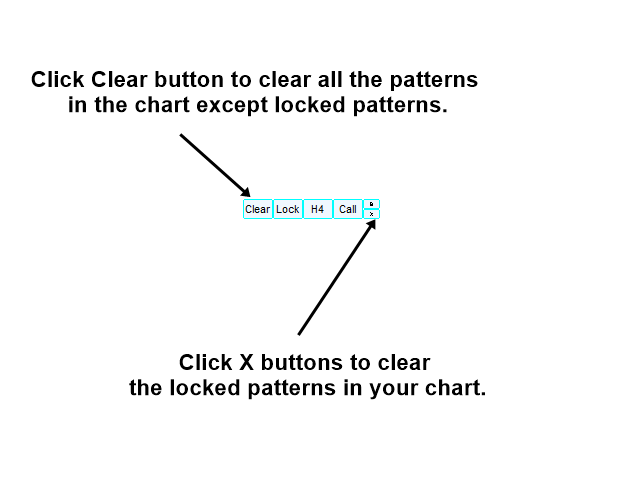 Pattern Locking: You can also lock any patterns in your chart for your future use. 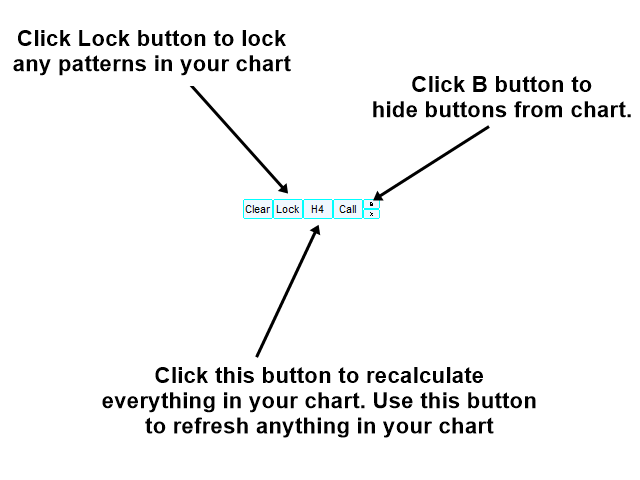 Just click over Lock button to lock patterns in your chart. 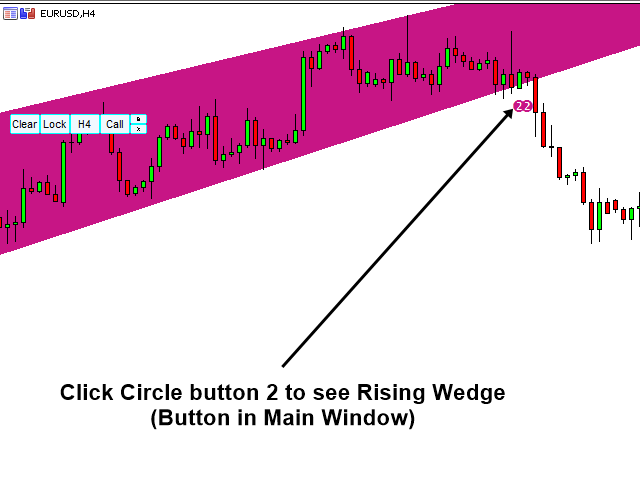 Advanced Price Pattern Scanner uses extremely sophisticated pattern algorithm exclusive to this indicator only. At the same time, it provides extremely simple user interface. You can also receive alert when new patterns are detected. Most of time you can use default setting. Each input is self-explanatory in their name field. Show Pattern At Alert: If this is set to true, then new pattern will be automatically draw as it is detected first time. Since you can access to all the patterns from circle button, you can set this to false if you wish. Following inputs are to control buttons. You will use default-setting most of time. You can change the input only if you have encounter some exceptional case. Yet, there are some other inputs for controlling colour and multiple timeframe pattern detection. We will leave them out here because they are too obvious. 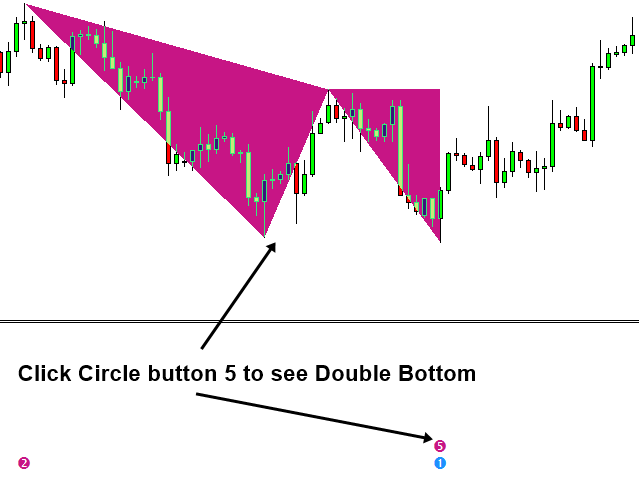 Using Wedge, Triangle, Double Top, Double Bottom, Head and Shoulder and Cup with Handle patterns are well documented in many places on internet. You can also test the indicator in history before using them for your live trading. Further more, you can use Advanced Price Pattern Scanner together with following tools for even higher precision and accuracy. In Version 6.6, Each pattern accuracy was improved. White chart Option was added. Pattern List on Comment was added. List Pattern type on Comment (Value = empty line number, 0 = disable). Empty line number is in fact spacing from the top of chart. In Version 6.5, you have an option to switch on and off forward detection mode. 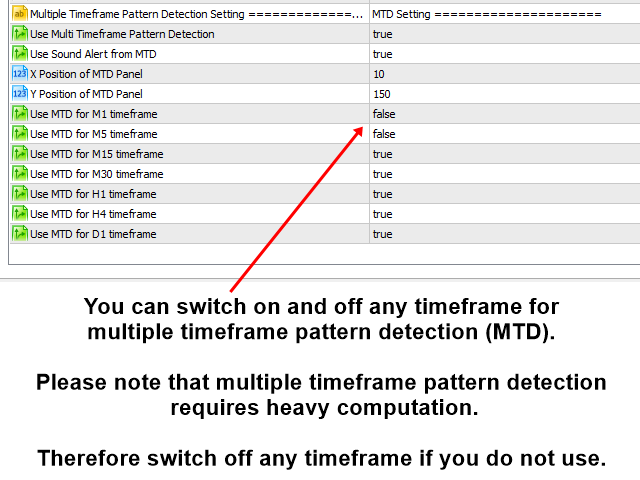 In version 6.3, we have made little improvement on multiple timeframe pattern detection. In version 6.2, Head and Shoulder Pattern and Cup and Handle Patterns are added in the Scanner. In Version 5.3, we have improved the feature of Predicting future patterns (action after Call button). In Version 5.2, we have improved the feature of Predicting future patterns (action after Call button).